Coconut oil has many health benefits. It is best to use unrefined coconut oil, but consumers might wonder which is better--virgin coconut oil or organic? For those wondering if same health benefits can be reaped from either coconut oil types, the answer is yes. Virgin coconut oil is only made from fresh coconut. 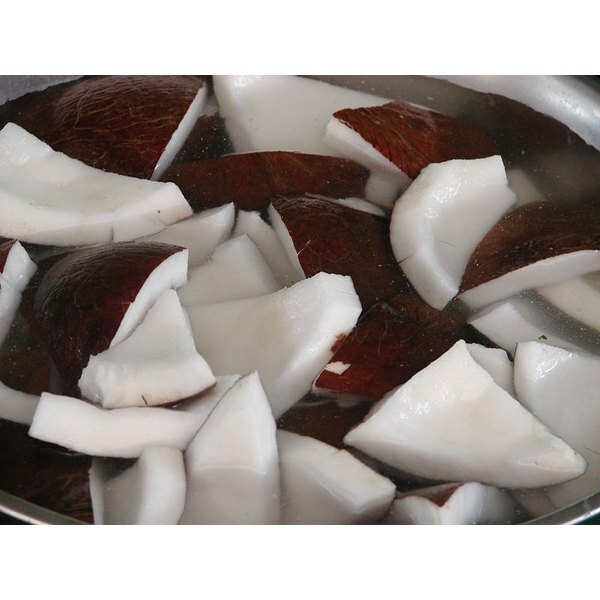 The oil is removed from the white meaty part of the coconut without the use of heat or chemicals. Virgin coconut oil, unlike refined coconut oil, is unprocessed. The typical processing of refined coconut oil includes the bleaching and the deodorizing of the oil. Unrefined coconut oils still retain the beneficial elements of fresh coconut. Organic coconut oil can be found in both virgin forms and pure forms. The real difference between organic coconut oil and other coconut oils is how the coconuts are grown. Organic coconut oil comes from trees that are grown in organic manure. These trees also have never had synthetic fertilizers of insecticides used on them. There are also no chemicals used during the oil extraction process. The extraction process is just like the process used to extract virgin coconut oil. It is very hard to tell the difference between virgin coconut oil and organic coconut oil. The flavor and appearance of both are nearly identical. However, organic coconut oil is generally considered to be a higher quality oil than other coconut oils. Around 50 percent of the fat found in coconut comes from lauric acids. According to Livestrong.com, "lauric acid is converted to monolaurin in the body, which is considered an anti-microbial substance leading to improved immunity." Both virgin and organic coconut oil contains medium-chain fatty acids. These acids are metabolized more like carbohydrates than fats in the body's systems. An added benefit of medium-chain fatty acids is that they provide a boost in metabolism. Both virgin and organic coconut oil have been reported to encourage weight loss. Bruce Fife, C.N.,N.D., author of "The Coconut Oil Miracle" says that his personal experience with coconut oil was that he lost 20 pounds over a 6-month period. Fife says that many people don't notice any weight loss when using coconut oil, but that is because many people overeat. Overindulging in any health food can lead to weight gain, or at the very least stall weight loss. The recommended dosage of both virgin and organic coconut oil is about 3 tablespoons daily. Fife suggests replacing all oils in the diet with coconut oil to help lose weight, or even take it strait by the spoonfull. Simply switching household oils to either virgin or organic varieties of coconut oil can result in a 36-pound weight loss over a year's time. Will Sunflower Oil Make You Lose Weight? What Is a Substitute for Soybean Oil?